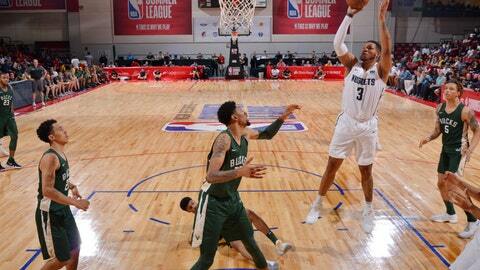 Sterling Brown poured in 27 points, but the Milwaukee Bucks lost to the Denver Nuggets 90-83 in their third game of the NBA Summer League in Las Vegas. Brown, who also led the team with seven rebounds, shot 2 of 6 from the arc, 3 for 4 from the charity stripe and 11 of 18 overall in the loss. D.J. Wilson added 18 points, including a team-high three 3-points, while Christian Wood scored 16. Travis Trice II led the team with six assists. Starting five: The Bucks started Jordan Barnett (SF), Wilson (PF), Wood (C), Brown (SG) and Trice II (PG).